Omoyajowo Olayinka Simult, a 400 level student of Medicine and Surgery at University of Ibadan, has won 2018 Governor John Kayode Fayemi’s Inauguration Essay Writing Competition. 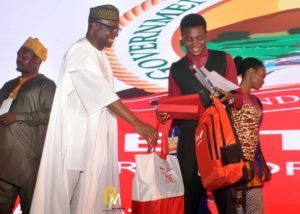 The essay competition was one of the many activities that heralded the inauguration and swearing-in of the new Governor of Ekiti State. According to the official release by Dr. Jimlas Ogunsakin, the Chairman of the Essay Writing Sub-Committee, the essay competition was organised to rekindle participation in governance and ensure a sense of inclusion among youths as far as development in Ekiti State was concerned. The essay competition was in three categories: secondary school, undergraduate and post-graduate categories. 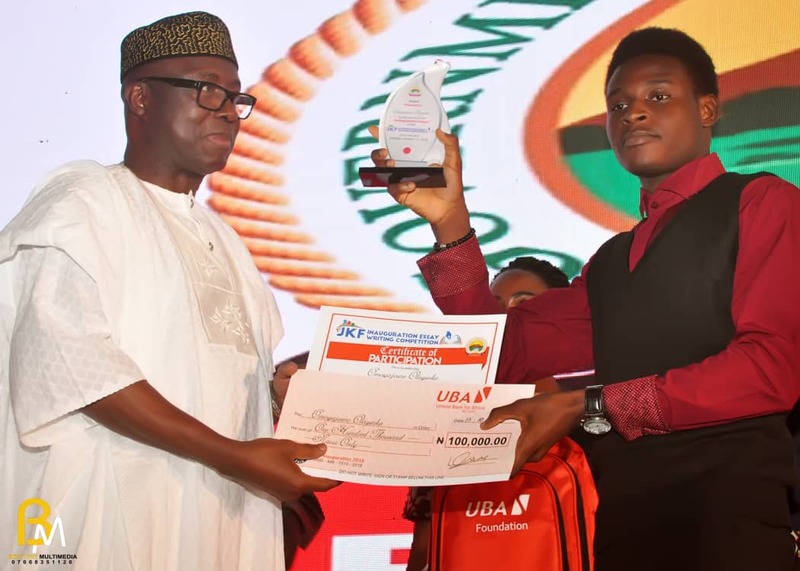 Omoya, as his colleagues fondly call him, received the first prize award for the undergraduate category at Afe Babalola Civic Centre in Adebayo, Ado-Ekiti, on Monday, October 15, 2018. The award ceremony was part of a bigger programme that included an inaugural lecture by Prof. Niyi Osundare, the launching of the newest volume of books written by Governor Kayode Fayemi, a panel discussion with Kunle Ajibade, a photo exhibition, among others. 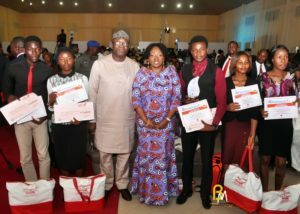 The first and second runners-up for the undergraduate category of the essay competition were, respectively, Ms. Osadipin Odunayo, a student of Food Technology at Rufus Giwa Polytechnic, and Mr. Aladeyelu Peter, a 400 level student of Medicine and Surgery at Obafemi Awolowo University. This announcement was after an intense 3-stage evaluation and scoring process that involved an interview with the panel of judges, where each finalist had to defend the originality of their essay and expound on its content. From L-R: Second runner-up, first runner-up, Dr. Kayode Fayemi(Executive Governor of Ekiti State), Erelu Bisi Fayemi (First Lady of Ekiti State), Omoyajowo Olayinka, 4th runner-up and 3rd runner-up. In his conversation with UIMSA Press, Omoya Simult said his winning entry was titled “Ekiti of My Dream: Reclaiming Our Land, Restoring Our Values.” His essay touched upon the history and core values of Ekiti people and suggested certain strategies the new administration could adopt in moving the state forward. He said, “I value this award very much because it has to do with Ekiti, a place that means a lot to me. I hope this award will encourage other youths to show interest in the political and economic affairs of their states and Nigeria”. He made a shout-out to his parents, Mr. & Mrs. E.A Omoya; his friends: Basit, Macazar, SegunFlames, Bukola, Tohberd, Dunsin and Ayoni; the entire 2k17 class and members of JCIN UI. He also praised Governor Fayemi for the brilliant initiative, saying it would go a long way in making intellectualism “cool” again. Simult’s award came with a cash prize of one hundred thousand naira, a plaque, lots of books and other attractive gifts. Hearty congratulations to him from UIMSA Press.